What is a trading floor? A trading floor refers to a literal floor in a building where equity, fixed income, futures, options, commodities, or foreign exchange traders buy and sell securities. Traders buy and sell securities on behalf of clients, or on behalf of the financial firm which employs them. The trading floor of an exchange is commonly called “the pit” because trading areas for different securities are usually designed as roughly circular areas that traders step down into to engage in trading. How is trading done on a trading floor? Sales and Trading professionalsSales and Trading Career ProfileThe sales & trading division (S&T) of an investment bank helps mutual funds, hedge funds, pension funds, etc. facilitate equities transactions (buy/sell). A career in sales & trading can be extremely strenuous with a very fast paced environment. The competition for positions is intense, compensation can be very high, on a trading floor trade use the “open outcry” method of trading. The open outcry method stands in stark contrast to the electronic, online trading methods used by modern exchanges. The flow of activity in trading pits is often fairly volatile. Trading activity is highest close to the opening and closing of trading, or when important changes take place that affect the market, such as the release of a key economic report. A “runner” approaching the pit with a brokerage order is met by traders who start shouting to get the attention of the appropriate broker even before the order has been given to her/him. Since only brokers at the top of the pit can see the runner, if those brokers suddenly become active, brokers further down the steps usually pick up on that fact and act accordingly. Traders at the center of the pit may also spur activity, because they may be the first ones to see an important change on information displays, which spurs them to action and accordingly results in greater activity throughout the pit. To deal with the volatility, general noise level, and frequent information overload, a common strategy among floor traders is to focus on certain other traders and/or information, and discount the rest. For example, trader “A” from one firm may have an understanding with trader “B” from another firm that whenever trader “A” is looking to sell shares of a certain stock, trader “B” will usually be willing to buy them. Therefore, when trader “A” does want to sell shares of that stock, rather than shouting offers to all of the traders in the pit, he will just look directly to trader “B”, indicating the number of shares he wishes to sell. Learn more about sales & trading career pathsSales and Trading Career ProfileThe sales & trading division (S&T) of an investment bank helps mutual funds, hedge funds, pension funds, etc. facilitate equities transactions (buy/sell). A career in sales & trading can be extremely strenuous with a very fast paced environment. The competition for positions is intense, compensation can be very high,. A contract is made when a trader announces that they wish to sell an asset at a particular price and another trader replies by saying that they will purchase the asset at the announced price. While these contracts are informal, it is critical to the integrity of trading that traders abide by them. If, for example, a trader reneged at the end of the day on an agreement he’d made in the pit to purchase a large lot of U.S. Treasury bonds, that single event could theoretically trigger a disruption of the entire bond market. Given that the traders involved in a deal may be standing 20 to 30 feet apart from each other when a deal is made, both the buying trader and the selling trader record the trade separately. After the trade has been confirmed by both parties, each trader’s clearing member reports their side of the deal to the clearing house. The clearing house attempts to match the two deals; until then, each side bears what is known as a non-comparison risk. If the deals are successfully matched, then the two traders acknowledge each other’s claim on the other. However, if the clearinghouse fails to match the deals, then an “out trade” is declared. Resolving out trades can be expensive but they are almost always resolved in a timely manner, before trading starts the next trading day. Until the trade is accepted, the traders have claims against each other which are unsubstantiated, i.e., the deals lack a jointly written acknowledgment of the trade. Thus, many traders choose to trade with traders who have long-standing relationships with them and whom they feel they can trust. The trading floor is a large room with several circular arenas known as pits. The pits have a flat center and broad steps ascending concentrically to the edge (the steps ensure that traders can see each other). Trading is conducted in the pits. Traders either stand in the center of the pit – facing outwards – or on the steps, facing inwards. Booths – which are assigned to brokerage firms – are situated close to pits and consist of electronic equipment (like telephones). 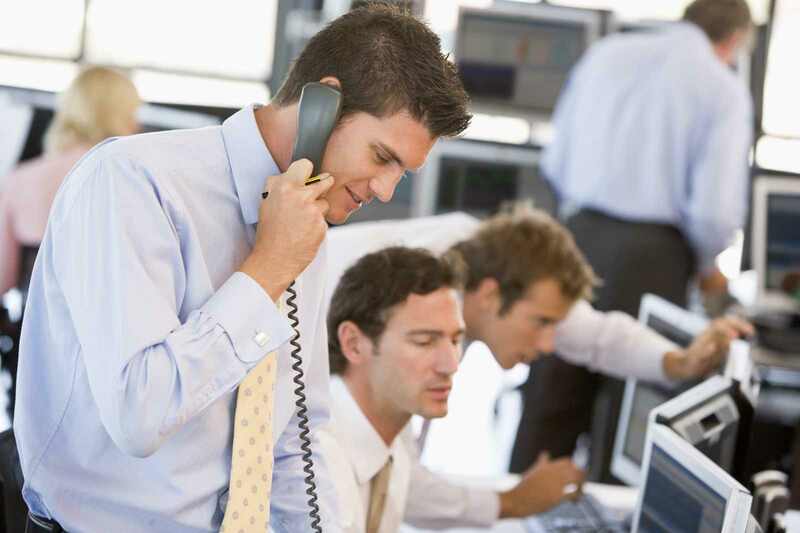 The booths receive orders from clients or the firm, and these orders are transmitted to the broker in the appropriate pit through a messenger. There are multiple devices which display information relevant to trading on the trading floor. A floor broker carries out trades on the behalf of clients, according to the orders given by the latter. Given that a floor broker works on the behalf of their client, they do not have as much decision making freedom as other professionals in the pit. An independent professional who is employed by multiple brokerages and receives a commission for her/his efforts. Retail clients rarely contact floor brokers directly. Instead, account executives take their orders and pass them on to the floor brokers. Active individual clients and large commercial clients may be in direct contact with their floor broker. A scalper is an independent trader who looks for temporary imbalances in the normal flow of orders in the pit from which they can earn a profit through the purchase and sale of assets in their own trading account. Scalpers reduce their downside risk by holding positions of a limited size. Scalpers provide “predictable immediacy” – liquidity and (sometimes) depth to the market as they allow other traders to finish their orders in a timely fashion and at a price which is similar to the last price – scalpers purchase at the bid price and sell at the asking price. A position trader takes a larger position than a scalper and holds the position for a longer time. A longer position results in lower turnover which in turn results in greater risk. Thus, position traders must ensure higher profit margins. Spreaders take opposing or offsetting positions in two or more commodities which are related to each other. They help create interlinkages between the prices in different but related markets, as a result of which trading pressures in one market affect prices in a related market. This increases the complexity of particular markets. Furthermore, spreading between inactive and active markets increases the liquidity of the inactive market. Hedgers are floor traders who represent a commercial firm. Hedging is the act of reducing risk by taking a position in a market which is the opposite of a position in another market. A specialist is a floor broker’s broker and dealer. Specialists came into being when floor brokers started operating from specific trading locations. A specialist allows a floor broker to execute orders for assets traded at a specific remote location.